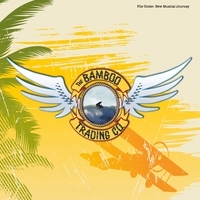 The Bamboo Trading Company consists of Gary Griffin, Randell Kirsch, Matt Jardine, Philip Bardowell, Chris English, and Miami Dan Yoe, with support from ESQ editor David Beard. As expected, there are some classic Beach Boys harmonic sounds alongside something of a tiki vibe, as well as some eastern sounds. The album presents itself as a musical journey from Kitty Hawk to the California waves; the same breadth as the SMiLE journey from Plymouth Rock to the good vibrations of the West Coast. While this record may not have Brian and Van Dyke’s ambition, there has clearly been a lot of thought to a coherent concept and track ordering, which makes the record satisfying. This come together perfectly on the rousing Kitty Hawk; one of the most innovative songs in the Beach Boys mold I have heard. Other standouts include Jericho and Don’t Say It’s Over. You can get the record on CD Baby and many other places. This entry was posted on Sunday, July 14th, 2013 at 8:07 pm	and is filed under General Music, Record Reviews. You can follow any responses to this entry through the RSS 2.0 feed. You can skip to the end and leave a response. Pinging is currently not allowed.